This date is in my diary. I was there when the LibDems held their conference in Brum in 2011. I’m adding my voice to the call on the TUC to support this as a national demonstration against the cuts, against the failed austerity. If the legitimate marchers from 26 March 2011 in London alone came to Brum, it would be an impressive outing – more have been involved since then. Flooding the centre of Birmingham with a sea of protest and protesters would send a message hard to dismiss, difficult to ignore. 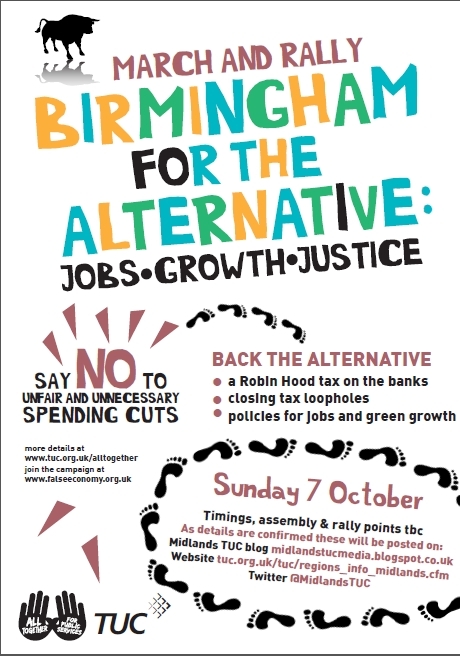 The Tories are coming back to Birmingham for their 2012 conference, and the TUC have called a demonstration. In 2010, 7,000 people came here for the Tory conference, and last years Liberal Democrat conference saw a banner drop and demonstration, and with austerity failing, this year’s conference should see a huge demo against the economic policies of the larger of the two coalition partners, calling for an alternative economic strategy. Put this date in your diary now, and start telling people about it. We are calling to the TUC to make this a national demonstraton against austerity and for unions around the UK to book coaches for members and benefit claimants to travel to Birmingham. 10:30am assemble in Victoria Square, Birmingham (B1 1BB). for march at 11.00am, then rally back in Vicotria Square.